I just wanted to write a short note of thanks to you, Dr. Zehr, and your highly professional staff. I have played USTA tennis tournaments since my mid-20s and was ranked #1 in the men’s 55 and over in Indiana. My on-court mobility and quality of life in general, however, had deteriorated due to left hip pain and I knew I would have to look at hip replacement as an option. I was 63 at the time of my hip replacement in January 2018 and certainly very apprehensive that I would ever be able to play competitively again. The guidance that I received from you and your staff during an initial consultation visit was very reassuring, so I opted to proceed with the replacement. Within 7 weeks I was hitting balls on the court and was playing singles and doubles recreationally at 4 months. 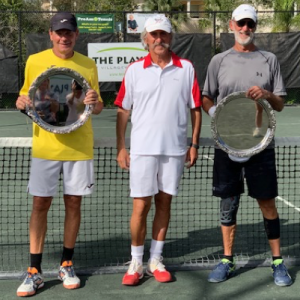 In February 2019, I entered my first post-surgery doubles tournament and was blessed to win it. My left hip is strong and court coverage has been remarkable. You know it is good when you don’t even think about it. More importantly than the tennis, I am now able to walk our retired greyhounds with my wife pain free! Thank you again for this life-changing surgery. 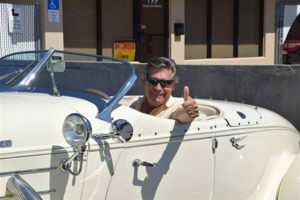 You asked for a photo for your “Frame of Fame.” This photo is of me finally enjoying one of my classic cars, since I can now operate the clutch of a manual transmission without pain. Of all my hobbies, automobiles are my favorite and I have not been able to enjoy my older cars with manual transmission since the pain in my left knee was too severe. Thanks to your expertise and your great staff, I was able to drive a car with automatic transmission 9 days after my left knee replacement and drive a car with manual transmission after just 6 weeks. After two years of having shots for pain and gel shots and arthroscopic surgery, I found Dr. Zehr. After a consultation, he advised a partial knee replacement because I had bone on bone arthritis and this would be the best way to go. After going home for the summer, I returned to have the surgery on November 1, 2017. Tomorrow (12/13/2017) I am going to be back on a tennis court. Thank you Dr. Zehr and Christina and staff for answering all my questions and great care. I will be 71 this March. My name is Barbara Murray, I am 69 years of age. I was told by 3 orthopaedics that a total hip replacement was necessary! I have not even had a flu shot since high school and certainly was not looking forward to this operation! With the confidence, full support, and experts that I so trusted, I am playing golf at 5 weeks and walking like a champ. I never had any doubt from beginning to end that Zehr Orthopaedics was the place to be! Thank you from the bottom of my heart! Dr. Zehr is the most efficient, effective, and personable doctor and surgeon. He replaced my right hip in early July. I have had the most amazing results. I had tremendous back and hip pain prior to surgery. I am pain free as of the day after surgery. I travel extensively and feel so much stronger and energetic than I have in years. His staff is courteous and professional and his office is welcoming and comforting. I highly recommend Dr. Zehr. He is the only choice! Thank you to everyone involved with my husband’s total hip replacement surgery! From Dr. Zehr, to his staff, to all at Landmark Hospital in Naples and his home healthcare PT Carmen and his nurse Kate! This truly was the best experience. My husband not only walked 1 hr after recovery, he walked the entire corridor of his hospital floor! He was home the day after surgery and with continued PT he’s as good as new and even better! I thank each and every one of you! Highly recommended to anyone in need of hip surgery! Dr. Zehr did my left hip 3 years ago & it was such a positive surgery experience. Very little pain and back golfing within a few weeks. So when I needed my right hip done I went back to Dr. Zehr. This time was EVEN BETTER!! The anterior approach is the best & he is the best at it in my opinion. 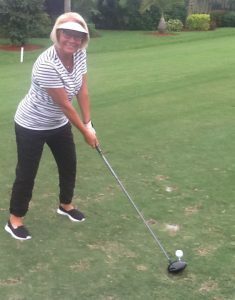 I was walking without a walker or cane the next day and I went back to my regular golf game 10 days after the surgery. This is crazy and I can’t say enough good things about Dr. Zehr and his staff. I just started enjoying yoga sessions at the Naples YMCA. As we were in the various contortions today, I kept thinking, “Thank you, Dr. Zehr, for replacing my hip last year with your minimally invasive approach.” There is NO WAY I could twist and turn my hip with these poses if I had gone to a doctor other than Dr. Zehr! Same for my husband, next to me in the class, with his partial knee replacement by Dr. Zehr. The Zehr Ortho team has enabled us to enjoy many of life’s pleasures again. I just love my new hip!! My hip is twenty-three days old and just about as good as my natural hip, before the osteoarthritis destroyed it. I marvel at the fact that I am now walking, without pain, tall and straight. And looking forward to getting back to Bickram yoga and all I did before the deterioration set in. The whole Zehr team excels in everything they do. And a well run organization, ten stars in my book. Dr. Zehr makes sure his protocol is followed to the letter, for your benefit. The overall process was so controlled and understood ahead of time that great results were inevitable. The key for me was the therapy plan after surgery. Especially the 6 day a week in-home therapy, in my opinion, was the reason for such quick recovery of the hip replacement. In two months able to do everything: biking, golf and tennis for a 73 year-old guy! I am so thankful I was referred to Dr. Zehr by a neighbor. Words cannot describe what a wonderful experience having him perform my total hip replacement was. Thank you, Dr. Zehr, you gave me my life back. Never having any major surgery before in my life, I was quite apprehensive. The office staff and the hospital staff were outstanding in relieving all of that. 5 STARS + TO ALL. The pre-surgical information provided is outstanding. Totally prepares you for a scary sounding surgery. I was out of the hospital the day after surgery, and climbing stairs in my 2-story condo. The method Dr. Zehr used left me in better shape than I have been for years. I took a trip only 4 months after hip replacement and I didn’t have even a hint of a limp. Range of motion is better than I can remember! I would recommend Dr. Zehr to anyone that I care about. The expertise exhibited and friendliness of Dr. Zehr and his entire staff bolstered my confidence throughout the preparation and recovery period. The BOOK provided to us is written in terms that spelled out everything required before and after surgery. Based on my positive experience, have recommended 2 people in which both had surgeries with excellent results. Dr. Zehr’s staff is friendly, professional, and always helpful with questions and concerns. Dr. Zehr spent time going over procedure I was having, answering questions. Very thorough with what to expect before, during and after surgery. I’m doing great after hip replacement! When I first found out that I would need a total hip replacement, I was in denial…then I felt hopeless. It seemed that my chance of seeing the world was over. However, you assured me I would be back to normal in not time. I made a promise to myself in the hospital that, if I was able to walk normal again, I would do all the things I had always dreamed of. 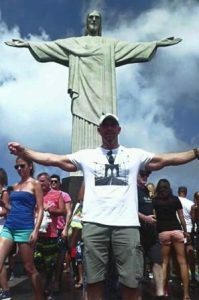 Well, since surgery, I have climbed the pyramids of Egypt and I walked the 220 steps to the top of The Christ Redeemer Statue in Brazil. I can’t thank you enough for your amazing skills and your commitment to my recovery. I am working out pain free and feel absolutely no restrictions or pain in my hip. I needed a knee replacement. He took time, patience to explain the entire process. Showed me the inside of my knee and what the photos indicated and what could be done about the defects in my knee. I was up and walking the next morning after the surgery and have not stopped walking since. the PT after was very good and helped me reach my full range of motion. There was virtually no pain. I only took three of the pain pills. My new knee is now my strong knee. I fully recommend him and his staff to anyone contemplating knee surgery. I came from my home in Panama to be treated by Dr. Zehr and his wonderful staff. He replaced my left hip this time, again with minimal pain and fast recovery. His successful replacement of my right hip 5 years ago proved to me he knew his stuff. Dr. Zehr and his team exceeded my expectations every step of the way from the initial exam to post-operative visit. I could not be happier with my decision to drive from Miami to Naples to see Dr. Zehr. Six weeks after total hip replacement surgery, I am able to hike, play handball and do everything else that I want to do. I will be 72 tomorrow and I feel like I’m 40. I did a lot of research to find the right surgeon and I found him – Dr. Zehr. Totally happy and satisfied patient. I had a total hip replacement. My entire experience was outstanding and amazing. I could not be more pleased with my outcome. After limping around for 2 plus years, Dr. Zehr and his team were able to return me to a normal life which includes golf, biking and distance walking in 6 weeks. Dr. Zehr’s anterior hip replacement approach made my recovery period so much faster than I could have hope for. At the upper right hand corner of Dr. Zehr’s letterhead it says, “…because living with pain isn’t really living!” So true. Before Dr. Zehr replaced BOTH of my knees in July 2014, that quote was a real part of my existence. When my husband would say, “Let’s go to Costco,” my heart would sink. I knew walking from the parking lot into the store and doing the shopping once inside was going to be so painful. Living in a golf community of retired, but very active people, I surveyed several friends for a recommendation for an ortho doctor. Dr. Zehr’s name was the one name I heard over and over and over again. Others were mentioned, but their reviews were not as positive as Dr. Zehr’s was. I visited Dr. Zehr’s office and he evaluated my knees, looked at the x-rays and then looked at me and said, “This did not happen yesterday.” No, it did not, it had been at least 15 years. (Did I mention I was 60 when I had the operation? Younger than most, but still the pain was excruciating!) Dr. Zehr, his office staff, his nurse Karla, his PA-C Christiane, and his x-ray technician work together like a well-greased machine. I had many questions in the weeks leading up to the operation and everyone was so helpful. I would call the office and they were on top of everything and always had time for me! Four weeks after surgery I was out pitching and putting on the golf course. Feeling better than ever! Now, one year later, I still am amazed I can walk the mall and not feel any pain! My husband and I are planning a vacation that will entail a lot of walking and I am not thinking twice about it. My operation was July 8, 2014. Today, July 9, 2015, I went for my one-year checkup. Everything is fine. I feel fantastic. When Dr. Zehr said, “I’ll see you in 5 years,” I felt sad, believe it or not! I whole-hardheartedly recommend Dr. Zehr if you need a knee or hip replacement (many of our friends have had him replace their hips). You will not be sorry “because living with pain isn’t really living!” Ask me, I know!!! Dr. Zehr and his staff are the real deal. I researched for quite a while to find the right hip doctor and him and his organization fulfilled every expectation. The best part is, I can walk again without pain and that is such a huge relief. From the office staff, to the hospital to the physical therapists, every situation was a very positive experience. Recovery is much shorter with Dr. Zehr’s anterior method and fun listening to friends be amazed at my progress. I can highly recommend Dr. Zehr for hip replacement surgery. I don’t have enough positives to describe Dr. Zehr and his entire staff. From the first phone “hello” until the final post op “see you later”, I was treated with the utmost respect and was well educated for each step of my joint replacement surgery. Although dreaded, the surgery and recovery really were uneventful, and my activities were only curtailed for a couple of weeks. The function and comfort of my new hip is amazing, truly beyond my expectations. 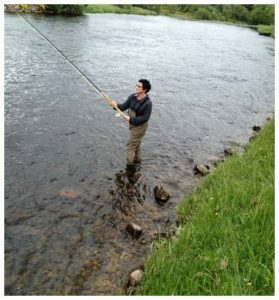 I’m back in my boats and scrambling for fish again—THANK YOU! I hold Dr. Robert J. Zehr & his team in high regard. He is a true professional, Dr. Zehr knows his area of expertise and he executes. Everyone on his team from his office to the hospital were all so knowledgeable in explaining everything to me so I did not have hundreds of questions; and cheering me on to get up and get walking!! Having been in aviation for many years, I so appreciated his well-scripted binder/checklist with detailed information of what to do and what to expect before and after my total hip replacement. For the first time in four years I am pain free! Played 18 holes of golf the other day and broke 100!!! Thank you Dr. Zehr and your team of professionals, you are truly THE BEST!!! 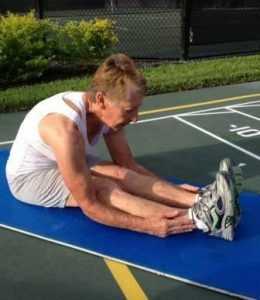 I am 59 years old and developed osteoarthritis in both hips due to sports, work and very active lifestyle. January 2011 I had my left hip replaced in Ohio by a top orthopedic surgeon. For this surgery, the minimally invasive posterior approach was used. In June of 2013 we moved full time to Ft. Myers, Florida. Needing my right hip replaced, I researched the minimally invasive anterior approach that has been developed since my left THR. This is what brought me to Zehr Center for Orthopaedics. November 2014 my right hip was replaced by Dr. Zehr and staff using the minimally invasive anterior approach. I now have a unique opportunity to compare the 2 approaches by 2 top notch surgeons. I was skeptical about the claims being made about the anterior approach because you are replacing a hip, by no means minor surgery. After surgery, I was up in 4 hours with a walker and walking full weight on both legs. I spent a total of 28 hours in the hospital and I was using a cane when it was time to go home. I could have walked out with the cane but hospital policy is wheelchair. I had my surgery on Nov. 25 and went off the cane 6 days after surgery. I walked in unassisted to my follow up appointment Dec. 4. It took 1 month with my left THR to get off the crutches/walker to full weight bearing and a few more months before I stopped using a cane. I had a prominent limp for 6 months and this time it was gone after a month. At 2 weeks, I was back riding my bicycle to the gym where I live and rehabbing on a spinner bike after 3 weeks. The best rehab is in a pool and as soon as the 3-inch incision closed, I was back in the water. At 6 weeks, I was where I was at 6 months with left THR. It has far surpassed my expectations. There is a vast difference between the 2 techniques and rehab time to get back to normal. I could go on but will end this by saying Dr. Zehr and staff are in a class of their own. With Dr. Zehr and the minimally invasive anterior approach, I am now at about 95% back to normal at 7 weeks. Post surgery pain was dramatically less and rapidly reduced. I did not use prescription blood thinners, only aspirin. Pain meds were discontinued after 2 weeks. No home PT or nursing care. The biggest key to successful joint replacement beyond the surgeon is support at home. My wife was so relieved with the difference this time and the help I needed at home. Our lives got back to normal very quickly. Thanks to Dr. Zehr and staff!! My name is Lezanne Bowman, I am 46 years old, and Dr. Zehr changed my life! For six months, I lived with excruciating pain in my right hip. I consulted a chiropractor and physical therapist, neither of which were able to provide any relief or a correct diagnosis. I then consulted with an orthopedic surgeon in Fort Myers, who delivered the shocking news that there was no cartilage left in my hip joint, and that in order to relieve my pain, I would require total hip replacement surgery. As my husband and I began to research total hip replacement surgery, my in-laws told us that a friend of theirs had successful hip replacement surgery performed by Dr. Robert Zehr. We learned that Dr. Zehr does not perform traditional hip replacement surgery, but rather utilizes a method called the anterior approach. This method was said to be less invasive, less painful, and lead to a quicker recovery. We scheduled a consultation with Dr. Zehr, and after his initial analysis and explanation of the procedure, immediately decided he was the man for the job. Dr. Zehr provided us with a manual that was clear, concise, and in layman’s terms described every detail of what to expect, from pre-op to rehabilitation. The surgery went flawlessly, and I was up walking with the aid of a walker the day of surgery. I was home two days after surgery, and walking unassisted two days later. The therapists, nurses, and Dr. Zehr’s staff, demonstrated that utmost competence and professionalism, and the rehabilitation process went exactly according to plan. My quality of life has now changed dramatically in two short months. I’m playing golf, going on long walks, and exercising on weight machines at the gym. PAIN FREE! Dr. Zehr, you have changed my life. Thanks to you and all your staff! My experience with Dr. Zehr has been a positive one. From the very beginning, I felt at ease with him and the office staff. I was extremely nervous about the whole procedure and they were wonderful with all of my questions and fears. I would highly recommend Dr. Zehr to anyone that needs a hip replacement!!! The whole procedure was much easier than expected and relatively pain free. Thank you Dr. Zehr!!! I love being outdoors and being active, but as a young woman with severe hip pain, I could not enjoy the many activities that I enjoy. I live in Colorado, but travel a lot. My arthritic hip was slowing me down. After searching for the right surgeon to help me, I was told about Dr. Zehr who does hip surgery differently from most surgeons. After talking with him and his team, I was sure this was the place to get myself restored. His anterior approach was great and I was able to recover very quickly. In a very short time I was back to my active self. Dr. Zehr and his team are really great! * two trips to a chiropractor. * the injection of cortisone. Since my surgery in February, my recovery has been nothing short of a miracle. I was dancing with my wife within two weeks. We traveled to Europe this spring where we walked over many uneven cobblestone streets and climbed many steep hills. There has been no need of any pain pills. Thank you Dr. Zehr for your skill and expertise. I love my new knee! Dr. Zehr is an exceptional surgeon with a kind and honest demeanor. I followed his protocol and had a swift and successful recovery. 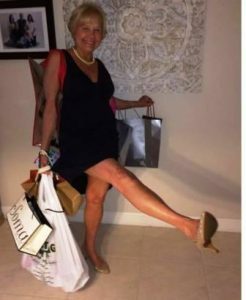 As the photo depicts, shopping is fun, but, chasing my young grandsons is my greatest pleasure and now pain free! The Zehr Center team have been incredibly supportive and helpful before, during, and after my surgery. I’m thrilled with my decision. To those of you reading this, put your doubts aside and your future comfort in Dr. Robert Zehr. I had gone to other hip surgeons and was so discouraged by their recommendations and prognosis that I almost gave up – until I heard about Dr. Zehr. I found out that he does hip surgery in an entirely different manner than the other surgeons. After spending time with him and his team, I knew I had found the right place. His surgery to replace my right hip gave me immediate relief. Within 5 weeks of my surgery I was out hiking the Appalachian Trail. Also important to me is enjoying my boat. Before surgery the limitation and pain was so great I could no longer get onto my boat. Just weeks after my surgery, I am easily getting onto the boat. I am truly grateful to Dr. Zehr and his team! Painless rotation driving through the ball… I can’t blame my hip for my high scores anymore! A+ to Dr. Zehr, your staff, and the hospital. You instilled me with confidence on our first meeting by answering every question and concern, and the manual you provided made an ideal reference, a striking example of your thoughtful professionalism. I didn’t foresee riding a bike, hitting golf balls, and spending three days walking unassisted through Disney World within a few weeks of surgery; neither did my friends who had traditional hip replacements and were astounded and jealous I avoided the many months of rehab they needed. Zehr Orthopaedics is world class; I couldn’t recommend you more highly! I only wish I had addressed my hip problem sooner. Thank you so much. As a hospital executive for almost 40 years, I have met many outstanding physicians. Dr. Robert Zehr is certainly one of them and that is why I chose him to do a revision of my failing total knee replacement. Both of my knees were replaced by another surgeon in Nashville, TN in 2006. Unfortunately, my right knee replacement came loose earlier than I expected and was causing me a great deal of pain. Dr. Zehr recommended a revision to a more stable design. after only two weeks I was out playing golf again. I played my first 18 holes in years with my friends where I was pain free! I only wish I had met Dr. Zehr in 2006. I played a lot of competitive racquetball which beat up my knees. Eventually the pain became too much. When I finally decided to do something about the pain, I attended 4-5 knee seminars including one by Dr. Zehr. I decided that he was the best doctor I could have to do my surgery. What surprised me the most was that I was up walking in the halls immediately after surgery which I really didn’t expect to happen. My one goal was to be able to walk with my two dogs again. Now I can walk 2 miles in the morning and 2 miles again at night with them. My knees feel so good I might just get back to racquetball again! I suffered several years with hip pain unable to mow my own lawn, drive a car or do everyday simple activities. I searched the internet and came across the Zehr Center website which gave me so much information on anterior hip surgery. Nobody in our area does this approach. I drove 3 ½ hours to see him and I’m glad I did. In short, I had my hip surgery and went home in under 2 days. I needed very little therapy and 3 weeks later I’m out mowing my lawn. Dr. Zehr and his staff are very positive, caring and always professional. I simply cannot find the words to express my gratitude to Dr.Zehr. I brag about him to everybody! I’m the lucky one, first because the arthritis in my hip progressed quickly. Within five months of the time that my hip began to be uncomfortable, I was limping and in much pain when I walked. I was fortunate to be able to schedule replacement surgery very quickly, so my body did not have to compensate for the weakness in my hip. I feel lucky to have found Dr. Zehr, with his anterior approach, allowing me to return to the fitness classes I love and to other activities, without restrictions. Dr. Zehr’s office staff paved the way to surgery, arranging pre-op procedures and providing a manual that answered every question I had. Following surgery, I began therapy immediately and after a couple of weeks, I added classes at the health club to complement my outpatient therapy. Three weeks to the day of my surgery, I returned to the botanical garden as a horticulture volunteer, balancing and reaching to pull weeds between the spiny plants in the arid garden. Soon, I was taking all the fitness classes I had taken before my operation – spinning, circuit training, yoga, strength and flexibility, plus walking without pain. Live with pain? Not me! Replacement is too easy! Just a brief word to tell you how pleased I am with the outcome of my two knee replacements. One last July and the other one this May. Surgery, after care and therapy went extremely well. I am back playing tennis, riding my bike and on my knees in my garden. My quality of life has been restored! My appreciation and thanks to you and your staff for the excellent, friendly and professional care you all provided. 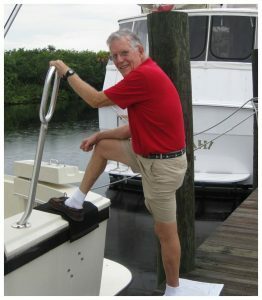 Before my hip replacement, I researched my options as I had learned a great deal from a prior double knee replacement. I selected Dr. Zehr because he offered an anterior hip replacement and answered my questions concisely and directly. Overall, I found Dr. Zehr and his team to be a well oiled unit, making my experience an easy one that allowed minimum discomfort and a quick recovery. I am back on the tennis courts and taking spin classes once again! I had experimental hip surgery when I was 26 for avascular necrosis. At that time is was uncertain how long this would last. When the pain started in my hip again, I asked my surgeon in Michigan for advice on who to see here in Naples. He told me that if it was his hip, he would have Dr. Zehr fix it since he was one of the best surgeons he knew. This gave me tremendous relief and after I met with Dr. Zehr, I was very confident with him. He spent time with me and explained everything that was going to happen. It went just like he said. Since my hip surgery, my life has changed so much. I have changed careers and am now a realtor. I have confidence in going up and down stairs when I show houses and am not in pain with clients. But the greatest thing is that I can now walk on the beach. This is a dream for me as before I couldn’t do it with the pain in my hip. I just wish I had done the surgery 10 years ago! My lifestyle has taken a toll on my knees at a young age. Between the military and years of high impact aerobics, my knees were in pretty bad shape. I love being a consultant with “Pampered Chef” which keeps me on my feet for hours at a time cooking. The problem was that my knees were always painful and I thought I might have to give it up. Thankfully I found Dr. Zehr who discovered that both of my knees were bone on bone. He recommended partial knee replacements for both of my knees. Now my knees feel great. I can take long bike rides, walks on the beach and most of all, keep up with my cooking. My lifestyle is back to where I had always dreamed it could be! I endured decades of pain in my knee and hip. Once I found Dr. Zehr, I knew I had the right guy to help me. Since I had my hip and then my knee replaced, I have had no pain at all in either joint. My quality of life has gone from poor to nearly perfect. I now can bike, walk the treadmill and lift weights like I used to do. The two surgeries have contributed immeasurably to my return to normalcy. Now I can keep up with my grandson. My advice, if you are enduring joint pain, consider the dramatic change that a replacement could bring to your life. My husband went to Dr. Zehr for a hip problem. I too, have hip issues. I was so impressed I made an appointment for myself. Dr. Zehr is a soft spoken, extremely knowledgeable man. He spent the time needed and explained my problems, step by step, including x-ray illustrated. He explained my options, and answered any questions I had. He did nothing without first explaining, and then advising me, followed by my feelings on each. I would recommend Dr. Zehr to my family, friends, and anyone looking for a knowledgeable, caring, orthopaedic. My knees were so bowed and hurt every single day. I finally decided to do something about it. I got opinions from several local surgeons, but realized Dr. Zehr was the right guy. I had both knees replaced at the same time and now I am back to full duty as a fireman. I lift weights and work out with the 20-year-olds at the station. I don’t even think about my knees anymore. Part of my job is climbing a 130 foot ladder which I can do in about 30 seconds. After living with knee pain for so long I cannot believe how great my knees are now. The quality of life is 1000-fold better. I am SO glad I had my total knee replacement by Dr. Zehr. 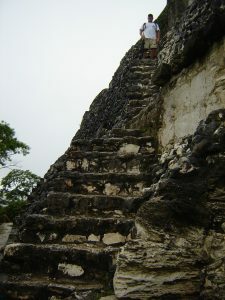 Before, just walking up or down a low hill, stairs, getting up and down from a chair were slow and very painful. Now I can bike, swim, golf (although my score still reflects my lack of talent!! ), travel and truly enjoy life. The staff was helpful and informative before and after surgery. I never felt like “just a number.” I was greeted by name on my first visit. Have the surgery. Do the work (rehab is the key). Life is too short to live in pain! I had right hip surgery done in Boston in 2004 (old method). The recovery was lengthy and painful. The left hip got to the point this year that I knew I needed surgery. Thanks to Dr Zehr and his team I am playing golf pain free. Now I can walk the dog or just go for a walk pain free. I really can’t say enough to praise Dr. Zehr and his staff. From my initial consultation to my post-op visit, I always knew I made the right choice in selecting a surgeon. I have had both methods of hip replacements, back and front. I strongly recommend Dr. Zehr and his anterior method. Dr. Zehr did a bilateral knee replacement on me Feb. 15, 2010. We laughed and I told him I would be his poster child! Well, I just wanted to let you know that I have just been named North Carolina’s Senior Female Tennis Player of the Year (2013). I am 69 years old (the rest of my body—-not my knees). Also, this coming September, I plan to ride my 1936 Indian Scout Motorcycle 4,100 miles (from Daytona Beach, Florida to Tacoma, Washington) on the Cannonball Endurance Run – crossing the country in 16 days in an effort to raise money for the Colon Cancer Alliance (I am a colon cancer survivor). I will be 70, my motorcycle 78, and the journey a challenging 4,100 miles. Life is good and I thank Dr. Zehr for giving me a renewed chance to keep living it to the max! From one surgeon to another with many thanks for restoring my two knees and two hips! Before my joints were replaced, the joy of my hunting trips was limited due to pain. Now that I can walk as far as I want, I am truly enjoying my life again. I am truly grateful to Dr. Zehr and his team for getting me back in the hunt! Having had the benefit of Dr. Zehr’s years of education and twenty-five years’ experience over the past eleven years, I am qualified to say Dr. Zehr’s expert evaluations and more importantly, his judgment of surgical techniques, have rescued me from excruciating pain. I have had a hip replacement and both knees replaced and recovered in record time due to Dr. Zehr’s style of healing therapy. It has allowed me to be independent of former assistance. 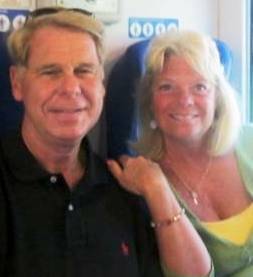 Now, I enjoy traveling, to be present for weddings, graduations and major events in the lives of our 16 grandchildren. I am 83 yrs. young, my mother lived over 100 because she said, “I don’t want to miss anything” –neither do I– therefore, I expect to be around to thank Dr. Zehr for the next twenty years. I am 59 years old…my right hip had been failing for quite a while and was really affecting many aspects of my life. Being a due diligence person I did extensive research selecting the right physician for my surgery. All indicators led me to Dr. Zehr and the anterior approach method that he uses for hip replacements. I have no regrets with my decision. Within one week there was great progress and I was walking with no walker or cane. Even the therapist was impressed and agreed that the anterior approach is really the best method for hip surgery. Many thanks to Dr. Zehr and his wonderful staff for all of their efforts on my behalf. My right hip was in terrible shape and I could hardly walk. I was set up to have surgery with another doctor, but at the last minute I became concerned. Thank goodness my daughter discovered Dr. Zehr and his anterior approach just in the nick of time. He did my surgery and it was an amazing success. I had no pain after surgery and my life is back to normal. I am again enjoying traveling, yoga and just walking pain free. I am so blessed to have my lifestyle back and very grateful to Dr. Zehr and his tremendous staff for their care and heroic effort. At 61 I was diagnosed with severe arthritis in my hip and the unbearable pain was interfering with my life. Dr. Zehr and his team of professionals made a positive difference for me with a total hip replacement. Within one week of my surgery, I was walking without aids and the pain in my hip was history. There are no adequate words to describe my gratitude to Dr. Zehr for relieving me of hip pain and allowing for a complete return to a very active lifestyle. Doing is believing! Finding yourself needing a total hip replacement at 50 isn’t anyone’s ideal predicament. After many other doctor visits and subsequent hours of research, finding Dr. Zehr was a blessing. I cannot say enough positive things about he and his staff. My surgery was just as explained. I was fortunate to be home within 24 hours, and my recovery was minimal. I teach martial arts to young children and I never missed a class. My surgery was Sept. 18th and I taught my next class on Sept. 24th. So thankful I found you…kudos Dr. Zehr! Dr. Zehr replaced my knee in April of 2009. I am so pleased with the outcome. Not only do I possess the smallest, minimal incision of anyone I have ever met that has had knee surgery, but the recuperation was remarkably short, especially since I have severe spinal problems. Dr. Zehr is professional, extremely competent and has a great sense of humor. He is a great doctor and a tribute to the medical profession. I did my homework on surgeons in the area. There are many good ones. I feel for this operation I chose the best. His staff is great both as professionals and caregivers. Dr. Zehr delivered what he promised. Everyone I talked to both before and after the surgery commented on how smooth the procedure went. One nurse told me it was because of how clean his procedure is and I mean the technical part. Although I am only nine days post operation, I know everything to date has been better than expected and I feel that I will say the same in the future. If I ever have other similar needs in the future the Zehr Center will be the place to help me correct those needs. It has been a very good partnership. Dr. Zehr has been my physician for over eight years. During that period, he has done full hip replacement on both hips and a full knee replacement on my right knee. I am happy to report everything is working as good as new! Dr. Zehr will not rush you into surgery, but rather, encourage you to wait until you really need the surgery and he will do it when you are ready. He is an outstanding surgeon! I am 7 weeks post surgery and can’t say enough good things of the left hip replacement performed by Dr. Zehr. He was not in a hurry to do surgery but when it was evident that was my only option his office made all the necessary arrangements for surgery on 3/13/13. His office gave me a loose-leaf binder that explained all that was going to happen and what to expect at every level of recovery. They set up in-home PT and they were excellent to work with and I was off the walker in a week. They were very supportive as was my outpatient PT. I was finished with that at the 6 week mark. I am playing golf again and I am pain free and credit Dr. Zehr with my quick recovery. The anterior hip replacement surgery is the only way to go. Thank you, Dr. Zehr and staff. I feel that you have changed my life. The dedication of Dr. Zehr, and his whole team, is a gift to everyone who has limited mobility and is suffering from chronic arthritis pain. Excellence doesn’t come without a willingness to sacrifice. We’re so fortunate to have surgeons like Dr. Zehr who are willing perform the Anterior Approach Hip Replacement and ultimately give of themselves, of their time, energy, and intelligence to fix the broken parts of the rest of us. Five weeks ago, I could not walk without pain. Six hours after Dr. Zehr performed my Anterior Approach Hip Replacement, I was walking. I felt like someone had “put the earth back under my feet.” I never dreamed it could be this good. I have no restrictions physically with this new hip. Dr. Zehr is a brilliant surgeon who is both confident and modest. He’s willing to listen but is exact in his opinion. You get the idea that he doesn’t take anything for granted, searches to find solutions to whatever problems he encounters, and works to achieve what seems nearly impossible. Because of his dedication to healing his patients in the best way possible, he performs the newer, yet more time consuming, Anterior Approach Hip Replacement so that patients like me can return to a normal life. I am grateful to Dr. Zehr and his whole team for getting me back to solid ground. This morning I walked two miles around the block and this afternoon I will go shopping! Thank you for being so good at what you do! I just hiked Mount Henry, a small mountain here in Western Maine. NO knee pain. I get clicking here and there but ride the bike 5/6 times a week, walk a lot, up and down ladders. Anyway, thank you for taking good care of me. Our home in Maine has 3 flights of stairs between the garage and bedroom. Took me a while to get used to that but I’m good now, it’s been a few months. Hope you are well and wish you the best. Thanks so much for the great job on my knee! At 10 days from surgery on my hip I am out hitting tennis balls with my friends and they can’t believe it. In fact, I am way ahead of schedule in my rehab efforts. Dr. Robert Zehr and his staff were fantastic. He does a different new procedure for hips by operating from the front of the hip instead of the rear. That way he does not cut any muscles and the recovery is much shorter. Only about 5% of hip surgeons use this procedure as special equipment is needed but I would highly recommend him if you or any of your relatives or friends need a knee or hip operation. I just had my second total knee replacement with Dr. Zehr and my recovery is even faster this time. The pain control is even better this time around and I am getting my motion back earlier. The use of my knees is critical in driving my car at high speeds and I wanted the best chance of regaining my lost knee function. This is why I have chosen Dr. Zehr again for my knee surgery. He is the best! I am looking forward to getting back on the race track where the thrill of speed is no longer diminished by the pain in my knees. My greatest thanks to Dr. Zehr and his team. The hips are working very well – one replaced 6 years ago, the other replaced 2 years ago. On a trip to Costa Rica my wife and I were the seniors in our group. We kept up very well flying through the forest and making some difficult climbs – much better than some of the youngsters! I will be 85 on December 9th. The new hips have made my life so much more enjoyable. Thanks Dr. Zehr! With the discomfort and pain I was experiencing in my left hip, I knew that in order to have the quality, active life to which I was accustomed, it was time to take steps to achieve it. On the advice of a friend, I visited with Dr. Zehr and was very confident that I had the right surgeon. Dr. Zehr and his staff were always helpful, warm, optimistic and encouraging about the entire process. Within seven weeks I was on the golf course enjoying my favorite activity. My golfing “buddies” could not believe the difference in my mobility. In fact, my scores improved greatly, much to their dismay! Thanks to Dr. Zehr I was walking in the afternoon after my anterior hip replacement in the morning and was walking unaided one week later. This gave me back the ability to exercise in the gym to help keep my diabetes in control, pain free. I don’t think about my hip as there is no pain and there are no restrictions as I carry on my daily life. I highly recommend Dr. Zehr as he is the best in the area. I suffer from kidney disease and am in its terminal stages. Two years ago the pain in my hip had become so severe that I could hardly walk. Golf became impossible. Dr. Zehr performed my hip operation using an anterior approach. I have a 4″ scar and absolutely no problems. Six weeks later I was playing 18 holes of golf. Should you have a joint problem -and it is curtailing the activities that you normally perform I would urge you to see Dr. Zehr and have it remedied. I had both knees replaced by Dr. Zehr about 4 years apart. Since my recent knee was done, I am able to walk with no pain. More importantly I am able to perform as a professional singer on my feet for hours at a time with no pain. I am truly grateful to Dr. Zehr for his skill giving me an excellent result. I recommend Dr. Zehr constantly to the many people who see how well I can walk and perform. When severe pain began interfering with my golf and my nursing career, I chose Dr. Zehr as my surgeon for both of my hip replacements. Dr. Zehr always performs the latest techniques, is meticulous and educates his patients to know what to expect. I am often asked by my colleagues to recommend the best surgeon for their family or friends. Dr. Zehr is my #1 choice! Since my surgeries I am back to enjoying my life again! Being retired from the Cleveland Clinic, I had many options for my surgeon. Dr. Zehr replaced my left knee and I had such a great outcome that when it came time for my other knee surgery–why would I go to anyone else? I had my second knee surgery and was back to my volunteer job two weeks later. Dr. Zehr has the best technique and his team is magical. Greetings From Utica, NY! As your patient, my hip replacement is sooo unbelievably normal that I seldom think about the procedure. Your expertise as a physician is truly remarkable, a gift that made my life practically normal. I searched the internet to find “the” surgeon to replace my arthritic knees. Dr. Robert Zehr was the one and only choice for me. His skills, counsel and approach to my orthopedic problems was superior. The concern, caring and professionalism of his staff was outstanding. There is no other choice in my mind than Dr. Zehr. Walking on the boardwalk with the waves breaking off the Atlantic Ocean are now part of my life again. I owe Dr. Zehr for giving me my life and pleasure back. Walking pain free for miles is his gift that keeps on giving. Thank you Dr. Zehr. I have known Dr. Zehr since his days at the Cleveland Clinic in Cleveland. 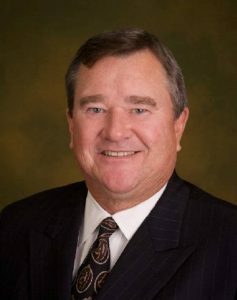 I knew that when it came time for me to have my knee replacement, there could be no one else with the skill and experience to do the surgery in Southwest Florida. Although I am not as fast as I remember myself in my youth, I am fast enough–and have no pain in my knee. I am grateful to Dr. Zehr and his team for an excellent result. Dr. Zehr and his staff have provided me with excellent care. But more than that, the atmosphere in the office is professional and friendly. After my partial knee replacement, I had very little discomfort. Now, I can kneel when planting my garden. My decision to have this procedure has helped me return to activities I enjoy. I couldn’t be happier. Thanks, Dr. Zehr. I suffered for ten plus years with hip pain, scared to have surgery. FIVE weeks later and no pain and back to tennis and golf, I was HAPPY to have had it done….what a wonderful miracle…thanks DOC! I limped around for 4 years delaying my hip replacement. Worst of all, I lost my golf swing. Couldn’t get over to my right side due to the pain!! Even my dog was bored with my pain…our long walks had been reduced to a few circles in the yard. Enter Dr. Zehr and his great staff. He made me feel as if I was his only patient. No question I asked was considered a dumb question. And most importantly, Dr. Zehr was one of very few with experience expertly doing the “anterior approach hip.” I needn’t fly around the country looking for the right surgeon and hospitals with experience and modern equipment for this modern surgical approach – they are right here in Naples. Thanks Dr. Zehr – you gave my retirement life back to me! My golf game returned a long time ago and my dog loves me again! There is an extreme athleticism on the part of the horse and rider that goes with cutting. Thanks to the operation that Dr. Zehr performed on my knees, 4 months after surgery I was able to continue with my cutting horse competitions. Dr. Zehr is the Man with the Golden Hands. My knee replacements work great and I can continue to coach soccer at St. Ann’s School which I love. I bike and golf regularly and was experiencing a great deal of discomfort in my right hip. The anterior approach Dr. Zehr practices avoided a lengthy recovery period since no muscles were cut. I walked out of the hospital the morning after surgery with only the aid of a cane. I was driving two weeks later and riding my bike in three weeks. I was very impressed with the care and attention from Dr. Zehr and his staff. I have recommended Dr. Zehr to several of my friends. I stopped running and playing tennis because of knee and hip pain. My pain increased to where I couldn’t sleep. As an engineer I spent hours researching my options and surgeons. That’s when I found Dr Zehr and his minimally invasive surgical procedures. First, my knee was replaced and in a short while I was back on the tennis court, but I still had hip pain that radiat-ed down my leg — so once again I researched my options. I found that there was a new anterior approach hip surgery that had many advantages over the traditional approach. Not many surgeons were doing this type of surgery in the US. but Dr. Zehr told me he did this type of procedure. I was walking without assistance in days after the surgery and back doing all my previous activities in 6 weeks. Needless to say I was delighted. The Staff at The Zehr Center could not have been more caring and friendly. I was back on the tennis court and for the first time in ten years playing singles tennis. No more swelling, ice and pain…thank you people of the Zehr Center and Dr Zehr. I dealt with severe hip pain for three years. I could hardly get in and out of the car! Thanks to Dr. Zehr and his team, I was back to gardening, walking four miles each day and golfing within two months of surgery. 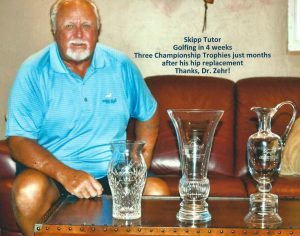 The anterior hip replacement that he performs is second to none! I wish I would have done it sooner! I put off my hip replacement and lived with the pain and diminished physical activities until one weekend I was finishing the 3 mile running phase of a sprint triathlon and… I stumbled and fell. Right then and there I made up my mind to get my hip replaced. You were as good as your word and you replaced my hip using the anterior hip approach. I am back to competing in triathlons. Thank you for listening to my hopes and desires and restoring me to my original level of activity. I just might be better now than before. Thanks to you for my anterior hip replacement. 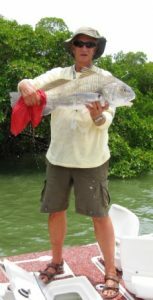 You did a great job and I was amazed and delighted at how quickly I was able to get back to a favorite hobby – collecting special shells on Sanibel Island. You were highly recommended to me and I happily recommend you to anyone contemplating a new hip. I had 2 total hip replacements performed by Dr. Zehr within 4 months of each other. Over time my pain was limiting my normal active lifestyle and I decided that this was not the way I wanted to live in the future. Dr. Zehr and his staff answered all of my questions and were very reassuring as I was naturally anxious about this surgery. I was back playing golf and tennis within 6 weeks after my first replacement and was convinced that having my other hip replaced was the best decision for me. I recovered from my second surgery faster than the first and am now pain free. I am very happy that I chose Dr. Zehr and his very competent and professional staff to perform these procedures! The direct anterior approach to total hip replacement is a specialty of the Zehr Center for Orthopaedics. I am totally grateful to Dr. Zehr and his entire team, including my PT with Ryan Senkarik, for getting me on track to a more comfortable and productive way of life. 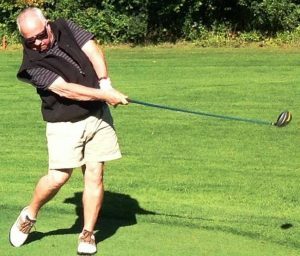 Six (6) days post hip replacement surgery I was walking unassisted (no cane/walker) and on at least 4 occasions, during this time period, I walked at least one mile per day and at 14 days I was swinging an 8 iron on the driving range! Thanks Dr. Zehr and may God bless you for your amazing skills and unique approach to hip restoration. I am 100% happy with my new hip. I give the credit for my quick recovery to your excellent method and my hard work. I have told everyone that this method is preferable, and they should tell anyone needing hip replacement about it. I’ve told friends from Western Michigan, where the anterior method is not available, that it is worth the trip down here to have you do it! Dr. Zehr has replaced both my knees, one two years ago and the other 6 weeks ago. I highly recommend (and have to several people already) him if considering a knee replacement. He was excellent two years ago and has even improved on excellence on this most recent surgery! Dr. Zehr said you can’t walk too much—so in the hospital I lead the pack in laps walked around the floor. I did the exercises with therapist at home and when she said do another set later in the day, I did!! I followed the same format at out-patient therapy and I was golfing 9 holes at 6 weeks with no pain!!! Now at 7 weeks I am still exercising and keeping active with no pain. I was very happy when the nurses would say—we all love Dr Zehr’s patients because they all do so well and I heard the same thing from the therapists—-so I figure he must be doing something special. Thanks to Dr. Zehr and the whole staff. I was off the walker in one week, off the cane in two weeks and hitting golf balls by the end of week three! The whole process could not have been smoother and I have had no pain since the day of my surgery.